Advanced microscopy is one of the most essential techniques in micro/nano-characterization to extract important information on the specimens. Efficient uses of advanced microscopy equipment require not only skills in equipment operation but also sufficient knowledge on the mechanism of image-formation in micrographs as well as good experiences of practical application of analysis to research. MJIIT Microscopy Lab Workshop Series aims to assist researchers and technicians to develop their skills and knowledge in order to encourage efficient uses of microscopy equipment and advance nano-characterization in Malaysia. 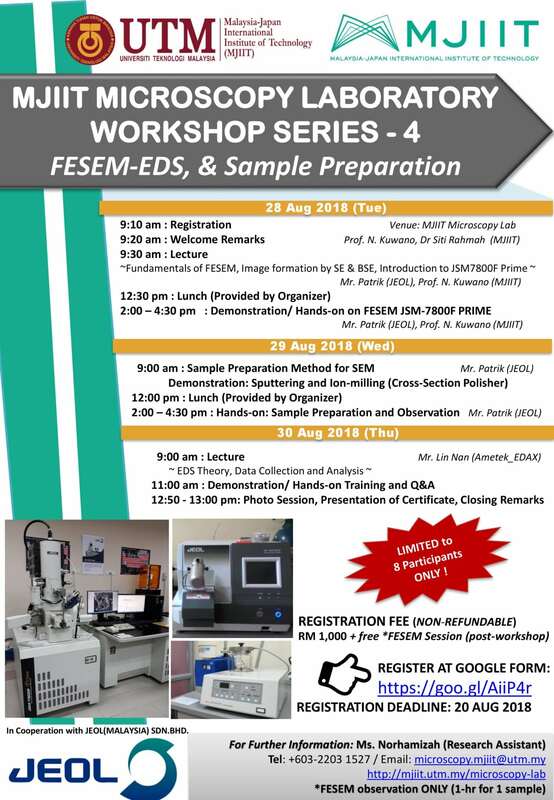 Following the successfulness of our Workshop Series 1-3, we are glad to inform that we will organize another one, which is MJIIT Microscopy Laboratory Workshop Series 4 in cooperation with JEOL (M) SDN BHD. We are focusing on the fundamental knowledge and basic operation of FESEM – EDS as well as specimen preparation. 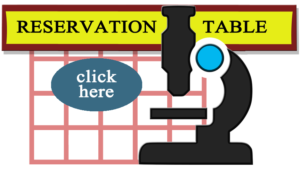 We are pleased to welcome young engineers and researchers of all related industries and universities to join the MJIIT Microscopy Lab Workshop Series-4.